You can listen to clips here by clicking on linked song titles in the Track Listing. <?-- #include file="includes/CompleteGreatestHitsAd.html" --> It's official! Thane Tierney told me on September 27, 2002 that Rhino Records' Gordon Lightfoot "Complete Greatest Hits" CD had gone Gold in Canada where a record must sell 50,000 units for this certification. This is Gord's 13th Gold (or higher) album in Canada. A year earlier, his Gord's Gold Volume 2 was certified Gold in the US, where sales of 500,000 units are required. "Complete Greatest Hits" is the first Gold record for Thane, and he couldn't be happier that it is for this album. 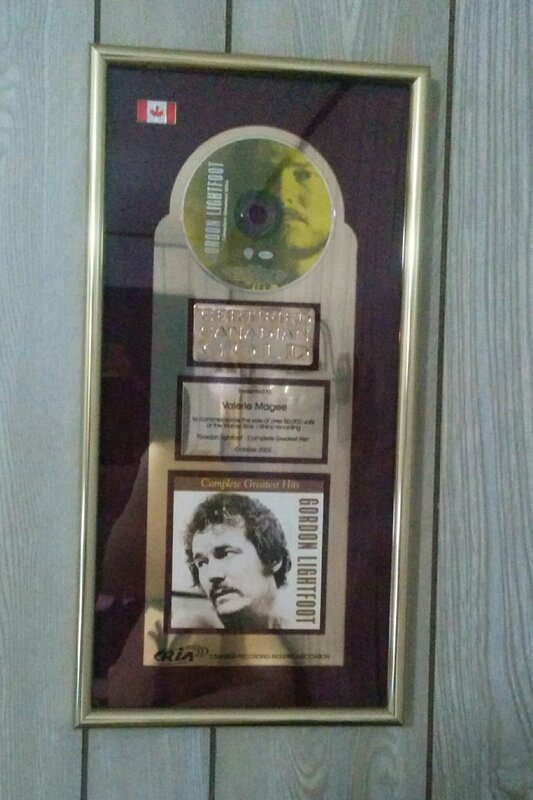 And I found out in late October that "Complete Greatest Hits" was the first Gold record for me too! <p> "Complete Greatest Hits", released April 2, has done very well in the stores from the start. It debuted at 165 on the Billboard album charts, and reached a high of 128 in the six weeks since its release. In Canada, it has charted as high as 21, having debuted at 38. The last Lightfoot album to chart was East Of Midnight, which peaked at 165 in the summer of 1986.<p>Released worldwide, it is available on both CD and cassette, and finally brings together all of Lightfoot's biggest hits onto one album using the original studio recording of each song. The single exception is The Circle Is Small where the later (Billboard charting) recording is used. "Complete Greatest Hits" includes six songs recorded while Lightfoot was with United Artists, and 14 songs recorded for Warner Brothers. All tracks have been beautifully remastered, and this includes four that were not on the 1999 boxed set Songbook. Bill Inglot, who did the remastering for the boxed set, has done the remastering for this release as well, and again makes it clear why he is considered one of the best in the business. The compilation was produced by Thane Tierney who also co-produced the 1999 Songbook boxed set with Lightfoot (read Thane's "review" here). The liner notes include a number of beautiful photos that are new to me. The release of this album has delayed the "Final Four" to the summer. Thane Tierney actually mentions the release of two of the albums when he talks about them in the Complete Greatest Hits liner notes, saying that they will make their CD debut in 2002. Read my article on the "Final Four" for the latest information about them. (The clips marked * are from the new CD; others are from an earlier CD or LP). The first six songs are from the United Artists original studio recordings. The Circle Is Small is the rerecording from Endless Wire. Race Among The Ruins, Daylight Katy, Stay Loose and Restless are not on the boxed set. Since the Waiting For You album is out of print and is difficult to find, the inclusion here of the wonderful Restless is a real bonus. This CD was advertised on TV, as is often done for "greatest hits" collections. OK, I'm a devoted fan. I admit it. But this 20 song collection is just the best single CD hits collection there is. Of course, when you look at the song titles, you will know that it has to be. 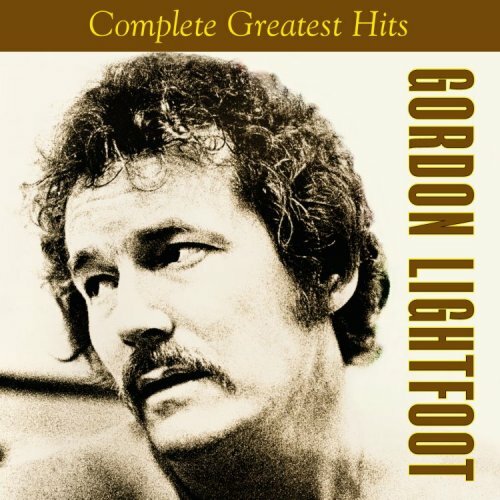 It is the first Lightfoot greatest hits collection to have the original version of all of his top charting songs, and also his original recording of songs that were hits for others before he was well established as a singer. So you find If You Could Read My Mind, Sundown, Carefree Highway and Wreck Of The Edmund Fitzgerald - the original recordings - as well as beautiful early recordings of such folks standards as Early Mornin' Rain, For Lovin' Me and Canadian Railroad Trilogy. In the only departure from "original" recordings, The Circle Is Small is the rerecording from Endless Wire, but this is the recording that charted. And, in his inimitable style, Lightfoot personally selected the final cut, the song Restless from the out of print 1993 album Waiting For You. Lightfoot loves the song, and when you hear it - perhaps for the first time - you will too. So, put together, you have an outstanding single CD collection - for the casual music lover or for the devoted Lightfoot fan. Even if you have all these songs on CD already (and the devoted fan probably does), you don't have them sounding like this! The remastering is unbelieveably exquisite; it is almost hard to believe, but some of the songs sound even better than on the Songbook boxed set! There are four songs here that aren't on the boxed set, and these sound much better than on the original CD, and two of the hits are from the single (vs. album) mix, so they really are somewhat different. The single mix of If You Could Read My Mind includes harmony vocals (by Lightfoot) that are not on the album version. The boxed set used the album version of every song (that had been on an album ever), while here Bill Inglot (who did the remastering for both Rhino Lightfoot releases) went to the single. The single version was also previously used on Gord's Gold, but the sound doesn't compare. And for Sundown also, Inglot went to the single. I still don't have a definite explanation of the difference, but you have only to listen to this cut and the one from any other CD and you will know you are hearing something different. And really great. Finally, Rhino has packaged this new greatest hits CD in their characteristic loving manner: full of photos, biographical text, and complete track notes. Thane Tierney (who co-produced the boxed set with Lightfoot), is the producer of this collection and he has done himself proud. If you don't have it yet, what are you waiting for?